Tasks can be considered public or private. 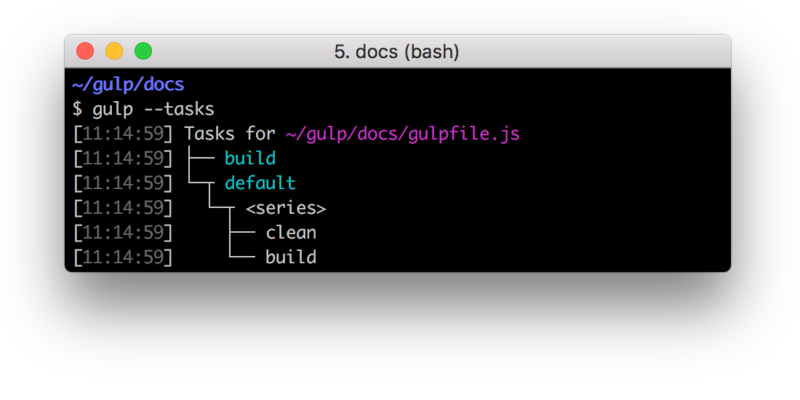 Public tasks are exported from your gulpfile, which allows them to be run by the gulp command. Private tasks are made to be used internally, usually used as part of series() or parallel() composition. A private task looks and acts like any other task, but an end-user can't ever execute it independently. To register a task publicly, export it from your gulpfile. // The `clean` function is not exported so it can be considered a private task. // It can still be used within the `series()` composition. // The `build` function is exported so it is public and can be run with the `gulp` command. // It can also be used within the `series()` composition. In the past, task() was used to register your functions as tasks. While that API is still available, exporting should be the primary registration mechanism, except in edge cases where exports won't work. Gulp provides two powerful composition methods, series() and parallel(), allowing individual tasks to be composed into larger operations. Both methods accept any number of task functions or composed operations. series() and parallel() can be nested within themselves or each other to any depth. To have your tasks execute in order, use the series() method. For tasks to run at maximum concurrency, combine them with the parallel() method. Tasks are composed immediately when either series() or parallel() is called. This allows variation in the composition instead of conditional behavior inside individual tasks. series() and parallel() can be nested to any arbitrary depth. When a composed operation is run, each task will be executed every time it was referenced. For example, a clean task referenced before two different tasks would be run twice and lead to undesired results. Instead, refactor the clean task to be specified in the final composition.